There's a Greek word, synechdoche, that refers to the way an ordinary object calls to mind a much bigger picture. I'll risk semantic impurity here to talk about a synecdoche that yesterday was pulled out of the dirt underneath Brady Hall. 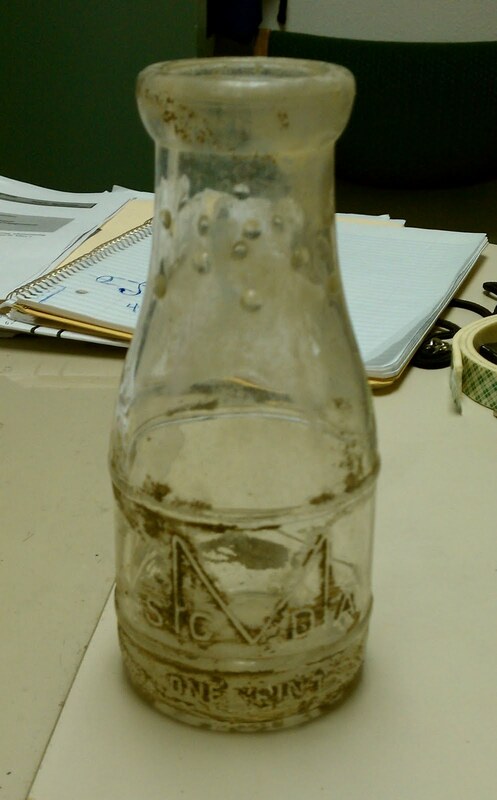 That object is a one-pint bottle of thick glass with a logo featuring a big M and the letters SCDA. It was removed from some exposed dirt in the basement of our beautiful Brady Hall by John Deeb, our assistant director of facilities (who took this picture). Of course, he was down there looking for something else. But as always in archives, we find interesting things when we aren't looking for them. John thinks it might be a milk or cream bottle. It would take a glass expert to identify its provenance, but let's assume it dates from the early 1930s when Brady Hall was first built and occupied. What bigger picture does an old pint bottle suggest? For one thing, how did it get there? Until 1939, Mount St. Mary's College was one lonely building atop a steep hill with little more than truck farms between it and Santa Monica. In those days before refrigerated trucks, that little bottle had to travel up two miles of winding dirt road – it wasn’t paved until about 1932. Was there milk delivery or did the Sisters have to buy it down the hill? Or did a worker bring it in his lunch? Brady went up in 1930 just as the Depression was settling in. An especially wet winter mobilized the fractured slate and shale on the hilltop and cost extra time, worry and money in the midst of construction. There were delays, problems with one of the architects. Did the workers lose pay while they waited this out? Was that bottle of milk "dear," as they used to say? Or did it come from the Mount kitchen? The whole student body in 1931 numbered fewer than 75 (top photo), but we know students in any era eat enough for an army. We can imagine the Sisters' little truck struggling up Bundy Drive weighted down with groceries. Did a hungry student sneak the bottle from the kitchen and then dispose of the evidence? 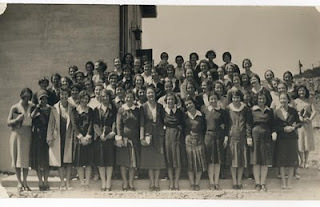 The Mount in the early 1930s was a special place to be sure. I mentioned that John was looking for something else when he came across the bottle yesterday. I had welcomed two visitors to the College Archives who arrived unannounced and on a mission. Many years ago they had befriended Rose Alice Wills Smith '31, who passed away in 2009 in her 90s. Rose Alice, they said, loved to talk about the Mount and spoke often of some "mementos" that the Class of 1931 left behind "in the basement." The two men were curious to see them. Would the mementos be in the archives? In 1931 there was only one basement – Brady’s – but I’d never heard of any artifacts being preserved. I pinged John, who expressed his doubts. He emailed me that the basements had been in constant use and as far as he knew, nothing of interest was ever found. But added that there were a couple places that were "rather remote" and might yield something. A short while later after a bit of digging (literally) he produced the little bottle. After that stroke of luck, he said hopes to keep digging (figuratively and literally) as time permits. It's doubtful that the mysterious “mementos” spoken of by Rose Alice would include litter, but in a sense the bottle is a memento of those early days just the same. It's often true in archives and preservation that mundane objects prove more interesting than “important” stuff for what they tell us about daily life in a bygone time -- that's the idea behind a synechdoche. It's fun to think about a famished coed in her navy-blue uniform, surreptitiously sipping from a bottle of milk, high above and far away from the world. Like I said, it's a special place.